While the ethnographic method is conventionally understood as a combination of fieldwork, participant observation, notetaking, and textual analysis, the speakers in this series reflect on their practice and commitment to alternative ethnographic methods such as videography, performance art, map-making, sonography, and poetry. There is a long history of experimental ethnographic methods in social science research. However, the shifting contemporary social world compels us to continue to ask ourselves: What are the limits of our ‘traditional’ methods and our received disciplinary traditions? What are the limits of the written word? What kind of experiences, modes of sociality, and sensory forms of knowing are not adequately accounted for through the ethnographic method? What kinds of data and understanding become possible through multi-sensory, arts-based, and experimental methods? What is an experimental sensibility and how might it be fostered? Located in the University of Toronto’s Department of Anthropology, the Ethnography Lab strives to encourage dynamic discussion and experimentation with the various ways in which ethnography is practiced and imagined. 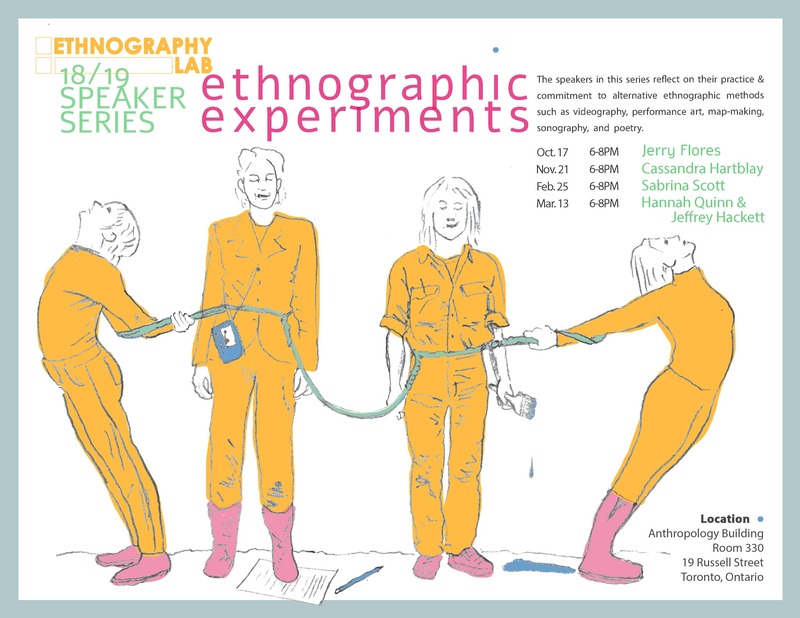 Join us in the Ethnography Lab Seminar Room, located in the Anthropology Building, room 330, on select Wednesdays from 6:00 pm – 8:00 pm for stimulating discussion. Contact the ethnography lab coordinator at ethnography.lab@utoronto.ca for more information.